It’s been a long time since I posted on this blog. I have lots of excuses… It’s the beginning of summer and it’s been really busy. I was sick. We went to church camp. But all of these “reasons” would be just excuses. The real reason I haven’t posted in the past month is because I didn’t know what to write. Every time I sat down to write, I would just look at the screen and blank. Nothing, nada! I have homeschooled my kids for almost 10 years now. Plus I graduated from homeschool myself. So I should be an expert. I should have lots of things to say! But when I would sit down to write, I couldn’t decide what to write about. I have been a single homeschooling mama now for almost four years. I haven’t done it as long as some of my favorite bloggers, but I have some experiences that I could share. So why am I stuck? I have been a Christian for nearly all of my life. I was taken to church just a few days after I was born. I have heard so many sermons and wonderful Christian encouragement, that I should be able to recite scripture in my sleep! So why could I not find one encouraging thing to say? A few years ago, I entered a drawing on a CPA exam forum, and miracle of miracles! I won a book called EntreLeadership by Dave Ramsey. Now, I had heard of Dave Ramsey before – who can listen to Christian radio all of their life and never hear of Dave Ramsey? But I had never actually paid much attention to his teachings and I most certainly didn’t apply his principles to my life. And sadly, the book I won got stashed on the shelf and was again neglected. But as I was going through boxes of books in preparation for this year’s school planning, I came across that book that had been buried in a box of books. And since I am trying to start a new bookkeeping business and getting a blog off the ground – you know, being an entrepreneur, I dusted off the book, and put it on my bedside table to be read. So last night I pulled it out to read before bed, and was pulled into this amazing book. If you have heard or read Dave Ramsey, you know what I’m talking about. His writing style is very conversational, and it’s not hard to read even though the subject matter tends to be something most people would rather not deal with. So as I was reading the beginning of Chapter 2 of EntreLeadership, I realized what the problem was with my blogging. And I knew this before… I just needed a reminder. Right there in black and white, were the words I needed to hear. The reason I have been struggling so much with my blogging is that I had no vision for where I wanted to go. No road map that guided my thoughts. I didn’t really know what my purpose was for this blog. And it was causing all kinds of problems. This is true of everything we do in life. We need a vision in our life to guide us. To help us know where we are headed, and the best way to get there. We wouldn’t go on a long trip without checking Google Maps, so why do we think we can coast through life with no clear plan or purpose? Do you know why you do the things you do every day? Why do you get up and go to work in the morning? If you don’t have a reason or a vision, getting up and going to work everyday is just that – work! When you have a purpose for the things you do, it makes it so much easier to do the things we need to do. Maybe you are a work-at-home mama. Have you figured out the reasons you are working from home? What motivates you to keep on going when the going gets tough? Because, rest assured, it will get tough. Why do you homeschool your kids? Because you dislike the government-run school system? Do you do it so you can teach your children your values? To instruct them in righteousness? Or maybe you know you can give them a more robust education than they would get somewhere else? What is your vision for your life? 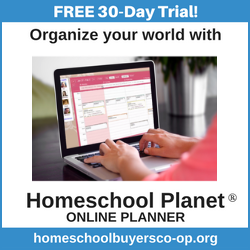 For your homeschool? For your parenting? I love connecting with my readers! Please comment and tell me how you have implemented your vision for your life. Or maybe you need help making your vision? I would love to help you! Love this article, it’s very true. Heading in a direction or making progress is extremely difficult if you don’t know where you want to go! A vision provides that. I often set visions and goals, but find that they change about as quickly as the weather. Which I think is fine. My vision last year is not the same as it was this year. Why? Things change. I think it’s important to remember that, and be willing to always adjust and reset yourself and your blog as necessary. Glad to hear you’ve discovered a vision, and I look forward to reading your upcoming articles! Oh – I’m a huge Dave Ramsey fan myself – His book, Total Money Makeover, made a huge difference in my life about 10 years ago. As I am sure you know, he seldom tells you want you want to hear, but always tells you what you NEED to hear. Dave Ramsey is my hero! I am working to overcome my stupid decisions and get completely debt-free. You would think as an accountant, I would have known better, but again… it sometimes takes me a while! I listen to Dave Ramsey podcasts often.. its just the kick in the pants I need most of the time. Hi, homeschooling mom to two here. I understand having a plan is really important. It is nice to meet you! Jen, nice to meet you too! I hope we can get to know one another better and “hang out” a bit! Thanks for your comment!